Based on the latest Internet Mobile Stats Trends, digital trends reports by “We are Social” shows that mobile has now reached the pivotal point and accounts for 55% of all web access. Smartphones and Tablets combined account for 55%. That is more that a 30% increase in mobile usage year-on-year. At the same time desktop and laptops fell by 20% and now account for only 45% of web traffic. This is good news for travel websites that are mobile optimized for bookings. The information is provided by TheNextWeb – It also noted that Social media has grown by eight percent year-on-year and now has a total penetration of 37 percent. That means that 2.539 billion of all 2.789 billion social media users came from mobile. 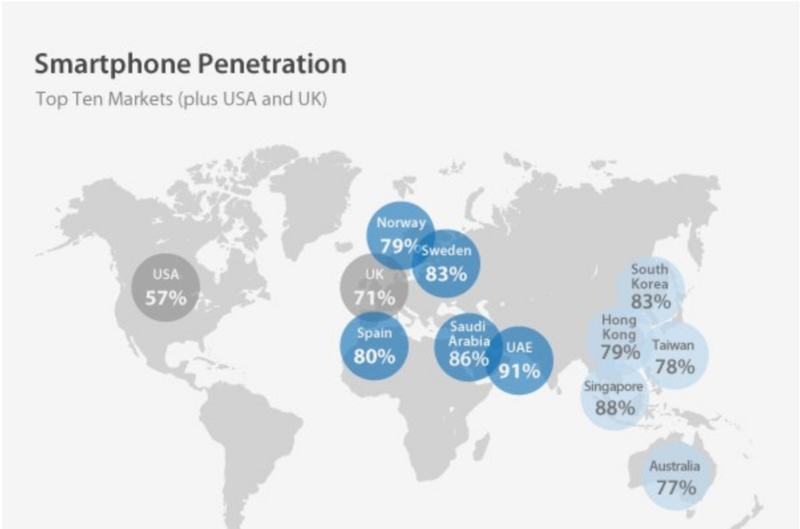 Of particular interest in this report is the smartphone penetration. It is 57% in North America. All other region in the chart outpace the US and Canada by a significant margin.